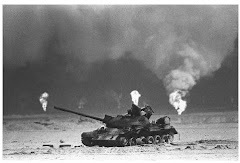 (91outcomes.blogspot.com - Sunday, August 2, 2009) - A presentation on Gulf War veterans' illnesses in now available online for the first time. Aimed at educating Gulf War veterans, their advocates and loved ones, and the general public, Veterans of the 1991 Gulf War: Bittersweet Victory, Treatments on the Way? 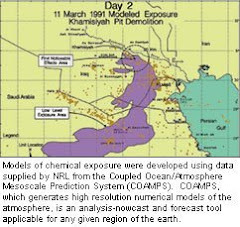 details the toxic soup to which troops of the 1991 Gulf War were exposed, the causes and nature of the neurological and immunological condition now known Gulf War Illness, and other diseases and illnesses affecting Gulf War veterans at statistically significant higher rates than their non-deployed Gulf War counterparts. The PowerPoint presentation was developed and delivered by Gulf War veteran Anthony Hardie of Madison, Wis., at a joint leadership conference of Vietnam Veterans of America (VVA), Associates of Vietnam Veterans of America (AVVA), Veterans of Modern Warfare (VMW), and the National Gulf War Resource Center (NGWRC). It is available on the VMW website. Hardie is one of the one-fourth to one-third of veterans of the 1991 Gulf War still suffering from Gulf War Illness. No treatments currently exist for Gulf War Illness.